This dish is quick to throw together and sure to impress your coworkers, family, or friends. You can serve it as a side dish or have it as a mid-afternoon snack for yourself or your family. 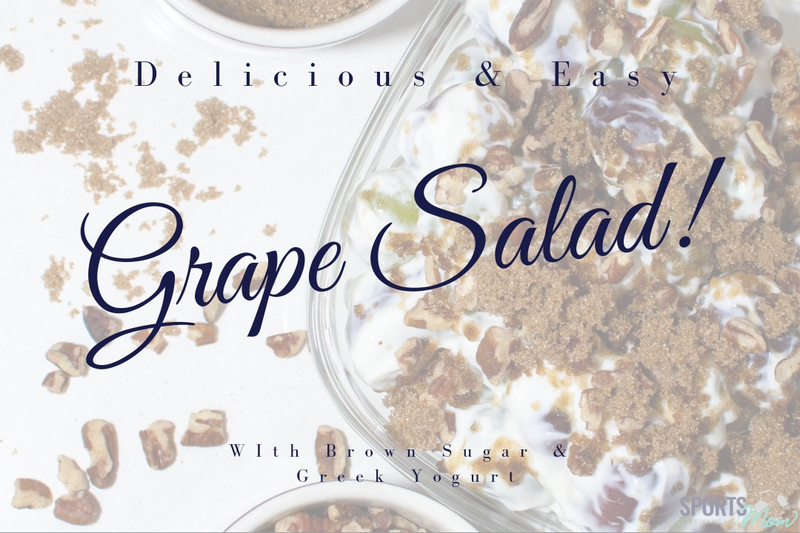 It looks fantastic with the bright pops of green and red grapes hidden throughout the sweet, creamy vanilla dressing, topped off with a scrumptious brown sugar pecan crumble. Yum! As a side dish, we recommend quartering the recipe. Feel free to play with the amount of sugar you add (if any) as many grape salad recipes add sugar to the creamy mixture but we have left it out. The grapes are sweet in their own right, and the vanilla Greek yogurt adds a satisfying level of sweetness without overdoing it. Give the grapes a thorough rinse in warm water to ensure any chemicals and dirt that may have found their way onto the surface of the grapes have been removed. Combine sour cream, cream cheese, and Greek yogurt into mixing bowl. Blend together until smooth. Stir the mixture with the grapes and pour into large serving bowl or storage container. Let the whole mixture sit for the evening prior to moving on to step five. If you are serving right away: combine brown sugar and pecans and sprinkle over top grapes. Serve in a shallow dish to allow a more even distribution of the yummy crumble topping. If you are not serving right away: store the brown sugar and pecans together in a container separate of the salad.